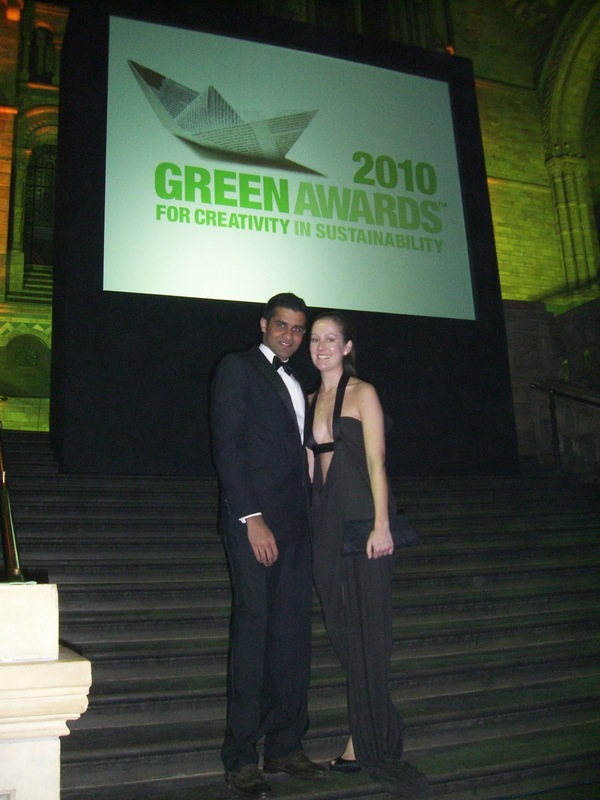 Last night Offset Warehouse had the privilege of being invited to the Green Awards 2010. The honour of the invite somewhat amplified by the breathtaking venue, the Natural History Museum (yes, dinner under that big dinosaur skeleton in the entrance), the ball gowns (Charlie in her ethical boutique gown from the Offset Warehouse Boutique) and the table's ethical place settings and flowers (beautiful, origami, recycled paper flowers to be exact) glowing under the ambient lighting. Offset Warehouse industrial design consultant, Ani Rao (left), with Offset Warehouse Director, Charlie (right). The hall was bustling with green entrepreneurs and businesses and we were fortunate to be on a winning table; RecycleBank who presented their project, "Waste not, want not" (UK) won their category and our very own industrial design consultant, Ani, received a High Commendation for his business, Kranium. (Left) Dinner in the great hall, with prizes presented by judge, Wayne Hemingway. (Right) Sir David Attenborough collecting his lifetime achievement award. But the highlight of the evening was being in the presence of Sir David Attenborough. Who gave a moving speech (which we've uploaded on our facebook page if you'd like to see) about sustainability and the need to be green now more than ever. Charlie and Ani both wear "Offset Warehouse" from the Boutique - Charlie in a gorgeous number from OSH, made from reclaimed materials, and Ani's bow-tie, made from woven old, cassette tape!